Took off from Ascension Island 0700 February 6, 1944, mission A/S sweep to include Commander Fourth Fleet estimate of enemy submarine plotted in General area of 10-00 S., 24-00 W. Clouds generally were cumulus with bases at 2000'. It had been agreed before take-off that if visibility was good, radar would not be used. The visibility was good and the radar was not used throughout the flight. At 1025 GMT plane was on a course of 270° T at 2500' making a speed of 145 knots when bow lookout sights object at 12 miles distant bearing 070° T from plane. 107-B-10, the other plane on the two plane sweep, was notified by voice of contact. Plane was immediately turned toward the object and all hands manned battle stations. Gave plane full power with throttles with 2500 R.P.M. but with no booster. Object was on course of 175° T and making approximately 10 knots speed. The bridge watch lookout at the time was disposed as follows: Obersteuermann (Fabig) 000º - 090º III. W. O. (Schmidt) 090º -180º Seaman Bohr 180º - 270º Seaman Roch 270º- 360ºRoch sighted the plane belatedly at an estimated distance of 2000 meters, and reported it to Fabig, who could not see the plane at once, and waited a moment before giving the alarm signal. Bohr manned one of the twin 20 mm. cannon and opened fire, but the other gun crews had no opportunity to reach their guns. In this connection it was stated that daily emergency gun drills had dulled the awareness of the gun crews, who "resented" the frequent interruptions of their rest. 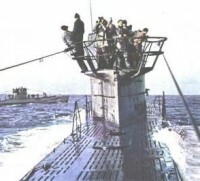 Their lethargic reaction to the genuine alarm, when it came, further sealed the fate of the U-boat.The Diesels were ordered to flank speed, and the U-boat turned to starboard. The first bomb was believed by survivors to have fallen directly onto the deck, well forward, the second next to the galley and the third just forward of the Control Room. The object was recognized as a submarine creating a heavy wake in a moderate sea. When plane was approximately two miles from sub a moderate amount of heavy anti-aircraft fire was noticed approximately 100 yards in front and slightly to port. Still having two miles to close target and believing that the AA fire would become more concentrated, put the plane into a power glide for a few seconds then pulled up for a short space. Then being at 1000' and having a range of about 3/4 of a mile went into attack run. During this maneuver the bow gun was brought to bear upon the C/T and no further AA fire was observed near the plane. At 1029 G.M.T. dropped six bombs from 100' altitude at 15° angle just forward of conning tower. 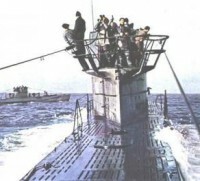 No men were observed on deck and submarine gave no indication of even attempting to crash dive. Just before passing over conning tower, gun flashes were noted coming from a position near conning tower. It was probable that they were machine gun flashes. At this time plane had full power with an indicated air speed of 210 knots. Immediately after the plane had passed over, the tail gunner commenced firing, expending 400 rounds of 50 calibre ammunition. Plane captain in the after station announced that he had obtained approximately 10 exposures as the plane passed over the submarine. Regained altitude to 800' and made sharp bank to port to continue attack with remaining three bombs. All 3 detonations shook the boat so drastically that a number of men were wounded by objects torn loose from their mountings and by flying glass. The lights did not go out. Buchholz was preparing to ascend to the bridge when the detonations occurred, and climbed out of the Conning Tower a moment later. Almost immediately, the U-boat settled and water started to pour into the Control Room through the Conning Tower hatch. The engineer officer, making no effort to regulate the boat's trim, shouted "Boot taucht allein, alles raus" ("she's going down, everybody out"). As one survivor clambered out, the Conning Tower was already under water, and the flow of water into the U-boat was so strong that he could hardly reach the bridge. It was believed that several large water entries forward of the Control Room had made the boat settle. About 20 officers and men, including Buchholz, jumped into the water, all others being trapped in the flooded, sinking boat. As they swam about, the bomber came over again and released 3 more depth charges on the swirl of the sinking U-boat. The detonation of these charges killed about 6 of the swimmers, including Buchholz and was felt by all of the survivors, several of whom were wounded by splinters while in the water. A moment later, there was a strong detonation from the area of the U-boat, which survivors believed to be the explosion of the batteries. The bombers now circled and flew low over the survivors, who expected to be machine-gunned, as the plane had strafed the U-boat while dropping the first series of depth charges; instead, they were merely photographed. Shortly thereafter, a second plane arrived as relief for the attacking bomber and dropped an inflatable rubber boat among the survivors. Fourteen officers and men reached the rubber boat. The bomber also dropped a life jacket to which provisions were attached. Upon turning noted that sub had completely disappeared from surface but noted large disturbance and conning tower a few feet under water. Submarine at this point appeared to be turning to starboard. Pressed home second attack by dropping the remaining three depth bombs at what was estimated to be well ahead of conning tower. These last three bombs were released at 1030 G.M.T. At time of release it was estimated that the sub had turned 75 degrees to starboard and was approximately 25 feet below the surface. Leveled plane off and then regained altitude. Made slow turn to left and came back low over scene of attack noting many survivors in water. Notified plane captain to stand by with auxiliary life raft which was dropped to survivors on second low sweep over survivors. After survivors had manned life raft made several low sweeps in order to obtain photographs of survivors. Then climbed to 1000' and circled scene of attack until relief plane arrived, at which time returned to base. Excellent performance by all crew. U 177 sent to the bottom a great tonnage of ships 2 of them in the South Atlantic.